Our team comprises a group of diverse professionals coming from different parts of the globe, with their common underlying commitment to add value to customers in our solution domains. We are proud to have their association with the variety of experiences they bring along to our clients. Our leadership team are experts in their own right, with the rich experience of having assisted a large number of global clients contributing to their overall business success. Gaurav Ahuja is CEO of BPM Vision. Gaurav is responsible for BPM Vision’s growth across its solution offerings and geographies. He leads the strategy and enablement of BPM’s business operations in the Asia Pacific region, including Australia, Singapore, Hong Kong, Philippines and India. Leveraging more than 18 years of senior executive roles in leading financial services giants such as Citi, HSBC and Pricewaterhouse Coopers in addition to a slew of start-ups with varied leadership roles leading Business Development and Sales, Advisory and Consulting, and IT, Gaurav guides the company’s risk management and people leadership initiatives directly involved in spearheading the company’s talent acquisition and talent management initiatives, while wearing multiple hats to assist the company’s ongoing growth and development. 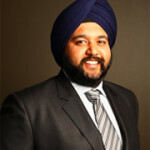 Gaurav holds multiple qualifications – an MBA in General Management and International Finance with a Beta Gamma Sigma honour from the Rochester Institute of Technology, New York; a Masters in Business Systems and IT from Monash University; and an undergraduate degree in Commerce and Accounting with honours. Gaurav is also a certified trainer and a graduate of the World Business Council, Geneva in Sustainable Development and has a passion for enabling young start-ups to become mature, sustainable and highly capable organisations delivering significant value to justify clients investments. Puneet is an experienced leader with more than 11 years’ experience in leading clients to derive value from their IT and project investment. Puneet is focused on raising the company’s profile in the Asia Pacific region and driving growth for our consulting and implementation services of HP solutions including HP Project and Portfolio Management, HP Application Lifecycle Management, HP Quality Center and HP IT Service Management, and delivering fast return on our clients’ technology investments. Chris Wenban is an experienced solution architect specialising in project, portfolio and demand management. She works with some of the largest companies in Asia Pacific to translate business requirements into technical processes that deliver rapid time to value. A Director of BPM Vision since 2008, Chris has more than 17 years’ experience in the IT industry, having held senior and consulting roles with Deloitte, HP software, Mercury and Accenture. Mark Leake is responsible for organisational capability within BPM, which includes the enablement of employees’ consulting and product skills in Australia and the Asia Pacific region. He has extensive experience in working with clients to streamline their processes and improve delivery capability in his capacity as a solution architect and project lead. He has over 17 years’ experience within the IT industry, and has a diverse software and project background that covers Project/ Portfolio Management, Service Management, Quality Assurance, HR/Payroll and Time & Attendance, within a variety of public and government organisations. Kribin Moodley is the head of Account Management for BPM Vision Australia. Kribin joined the BPM Vision team 4 years ago bringing to the table over 10 years’ experience implementing HP Project Portfolio Management solutions across Australia and South Africa. He has a proven track record with over 15 years in the IT industry and the past 12 years focusing on Project Portfolio Management solutions working in high pressure, team oriented environments across the financial, telecoms, mining and utilities industries. Kribin has an excellent ability to prompt and extend the thinking of clients into areas they can leverage PPM’s capability. He has helped clients in their strategic design process and help translate business needs into technical requirements, manage the technical correctness and completeness of designs and provide project leadership throughout the project lifecycle. If you are thinking how to extract value out of your current PPM investment, you should speak with Kribin now. Isabel Camus is the local Director and Corporate Manager of BPM Vision Philippines Inc. Isabel has significant corporate management experience working with local companies across industries in the Philippines. Isabel is client focused and highly proactive in ensuring our clients find us responsive and delivering on the commitments we make to providesustainable and resilient solutions to business problems. Please feel free to contact Isabel on isabel.camus@bpmvision.com.ph.